Acquire the materials necessary to repair the White Phial. Note: This quest can only be started after gaining full access to the Throat of the World during the quest of the same name. Talk to Quintus Navale about repairing the White Phial. A few days after the failed attempt to help the alchemist Nurelion realize his life's ambition (so long as you have unlocked the top of the Throat of the World by completing the similarly named quest), a courier will seek you out with a letter from Quintus Navale (Nurelion's assistant) who has grave news, and seeks your help. Head to Windhelm and locate The White Phial in the market district. In there, Nurelion will still be in his bed, coughing and slowly dying. Quintus, however, will be more than ready to explain what is needed to repair the Phial: "I have some thoughts. There are three crucial elements. Some may be easier to find than others. On the top of the Throat of the World is a patch of Unmelting Snow. No heat can touch it. Then we need the tusk of a mammoth, ground to a fine powder as only the giants know how. The final step is tricky. It requires the briar heart from a Forsworn of the Reach. If you can bring me these materials, the Phial can again be made whole." "The ivory produced by those beasts is as hard as iron. But the giants have found ways to make it yield.They're able to grind it down so fine that it can be infused into the lattice of packed snow. The finished material has the delicate nature of fresh powder snow, but the strength of the hardest steel." "On top of the Throat of the World is a patch of snow that's never melted. They say the Greybeards taught it to ignore the sun, and heat simply washes over it. The original Phial was made from this snow. We'll only need a small bit for the repairs." "The final tempering of the Phial was performed with a type of old magic that's been lost since the Dragon War. The nearest modern incarnation of it is the strange rituals practiced by the Forsworn. With the heart of one of their Briar Warriors, I can lock the Phial's magic into its physical form. It's difficult to explain to the layman -- forgive me if I begin waxing alchemic." The rather unremarkable patch of Unmelting Snow can be found at the Throat of The World. Mammoth Tusk Powder is in a large vat beside the giants at Stonehill Bluff, and it is possible to pick up the powder without aggravating the giants. Note that the Mammoth Tusk Powder is different from the alchemy ingredient Powdered Mammoth Tusk. A Briar Heart can be acquired from a dead Forsworn Briarheart and can be obtained from multiple Forsworn camps; one will be marked on your map. Nurelion will then die peacefully and Quintus will turn around and express his gratitude: "He is gone. But thanks to you, he died knowing his life's work was not in vain." When you say you are sorry to hear that old Nurelion is dead, he will respond: "As am I. You acted very nobly in helping my master realize his life's work. Thank you for that. As for myself, I've always been content to simply be an alchemist. I fear keeping the Phial would just remind me of Nurelion's obsession, and how it consumed him. Here, keep it. You are as much a part of its legend now as Curalmil was. I hope it brings you the happiness that my master desired." 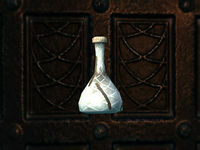 You will be given The White Phial, which functions as a potion of the nature you chose. Drinking it moves it to the Miscellaneous section of your items menu as The White Phial (Empty). It refills after 24 hours. Attempting to use the empty phial duplicates it, but only one phial will fill after the time has passed. Nurelion's dead body will disappear after some time. You can find his remains inside the coffin in the Hall of the Dead. 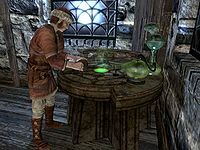 After Nurelion is dead, many of the contents of his store will be free for the taking, including many useful ingredients. If you are on an assignment for the Thieves Guild involving The White Phial (the shop), complete it and turn it in prior to completing this quest. Nurelion's passing at the end of the quest, though not caused by you, will still trigger you to fail the job for "killing". It is possible to reach the peak of the Throat of the World early, by using a horse to climb the mountain; however, doing so will not let you start this quest early - you have to advance the main questline in order to get the letter from Quintus Navale. 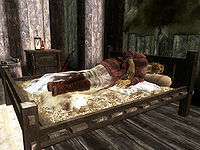 The courier may fail to deliver the note from Quintus even after you've gained access to the Throat of the World, making this quest unavailable. This bug is likely to occur if you have killed the Forsworn leader of Red Eagle Redoubt before(probably during find Red Eagle's sword). If so, use the following console commands: prid 2c9a0 and resurrect 1 to resurrect him. Wait a few real-world minutes then fast travel to any major city and the courier should show up. If the courier still fails to appear, try the command setstage MS12b 10. The courier bearing Quintus' letter may fail to arrive and instead loiter at Sarethi Farm. Traveling there and speaking to him may start the quest. You may be able to find the courier by using the console command player.moveto 39fb7 to move yourself to him. After you have started the quest, when you pick up a briar heart, the quest may not update, and no option to turn it in will appear when talking to Quintus. This can be caused by already having a briar heart in your inventory when you start this quest. The quest may not start if you already have a briar heart in your inventory when attempting to talk to Quintus. If you finish the quest with more than one briar heart in your inventory, the remaining hearts will still be marked as quest items, making them impossible to drop or store. If you already have a briar heart in your inventory before starting the quest, it will not be given to Quintus at the end of the quest; it will not be marked as a quest item immediately, but any briar hearts retrieved later on will become a quest item. If you don't want to install the unofficial patch, you can manually reset all of the items' quest item status through the console command resetquest MS12b, followed by completequest MS12b. Sometimes talking to Quintus will not update the quest, and trying to talk to him again will yield a result of "this person is busy". ? Use the setstage console command to advance the quest. When you return to Quintus with all three ingredients, there may be no dialogue option to turn them in, meaning you are stuck with an uncompleted quest, the three quest items, and no White Phial. This may happen because the Mammoth Tusk Powder was not marked as a quest item, allowing you to drop or store it before you brought it to Quintus. If you stored it, retrieve it and talk to Quintus again. If you can't retrieve it, you can manually spawn it by using the console command player.additem 6bc10 1. If you have initiated the quest to find Red Eagle's sword, the same Forsworn Briarheart might be the target of both quests. It will carry both Red Eagle's sword and a briar heart. However, even if you pick up both, it will only complete the Red Eagle quest. You will need to find a different Forsworn camp to complete the briar heart part of this quest. It is possible to receive more than one White Phial from Quintus if, after choosing what type of solution you want in the Phial, you quit the conversation and re-initiate it. After Quintus Navale shows him the Phial, Nurelion suddenly stands up and acts like he's dying, and you can't finish the quest. You can avoid this happening by removing his essential status before Quintus shows him the Phial. Open the console and type in SetEssential 14148 0. 100 Finishes quest I helped repair the White Phial in time for Nurelion to see it before he died. On the PC, it is possible to use the console to advance through the quest by entering setstage MS12b stage, where stage is the number of the stage you wish to complete. It is not possible to un-complete (i.e. go back) quest stages, but it is possible to clear all stages of the quest using resetquest MS12b. This page was last modified on 14 February 2019, at 06:19.